After much deliberation over the slew of thoughtful contest submissions, Motul Petit Le Mans fan Nick Calhoun was selected by a committee to serve as the Grand Marshal for the 21st Annual Motul Petit Le Mans. 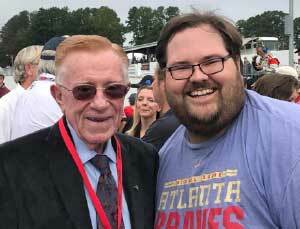 In honor of Dr. Don Panoz, who founded Motul Petit Le Mans and the American Le Mans Series and owned Road Atlanta for over 15 years, the honor of serving as Grand Marshal was given to a fan. Dr. Panoz built the series around the mantra “For the Fans”, so it’s only fitting that on our first Motul Petit Le Mans without him, a fan gives the start command. Over the last decade, my friends and I have always made Petit Le Mans the most important part of our year. It’s a sacred date on the calendar like a birthday or Christmas. We’ve developed traditions and ties that have bonded us together as life has scattered us across the southeast. There are the meat pies that were served for several years in a row that we can’t let go. There was the time Dr. Panoz almost ran over one of us in his Esperante. Most of all, we’ll never forget the rain soaked 2015 race where we used superior canopy engineering to ensure that we were the driest fans on the inside of turn 10. Last year at the 20th anniversary, I had the opportunity to meet Dr. Panoz on the grid while he was performing his duties as the Grand Marshal. I asked him for a photo and I thanked him for bringing this race to us, for giving my friends and I these memories, and for the development that he had given to the area. I was in awe of him. He was successful in multiple ventures in his life, I expected a simple thank you and a picture, but Dr. Panoz was so much more. He was warm, he asked where I was from and we talked about my hometown. He genuinely cared about me as a person and as a fan. I shared my experiences with him while officials tried to move him along, but Dr. Panoz embodied the “For the Fans” motto in a way that I believe no one else could. It wasn’t that he asked questions, but it was that he listened to the answers and responded. I felt like I was the only person at the race. When I found out that Dr. Panoz had passed, it wasn’t the transdermal patch, DeltaWing, Panoz Racing, or IMSA I thought about, but it was Dr. Panoz as a person and I missed him. I missed that conversation we had and felt as if one of my race friends had passed.